First off, I'll have to admit that I'm no Bond expert. To be honest, the only reason I ever gave Bond a second thought was because I saw a poster of Casino Royale and fell in love with Daniel Craig. I was 11, then, and I thought that Casino Royale was the sexiest film I'd ever seen. Since then I've only bothered to see Quantum of Solace, so really, I don't qualify to be giving Skyfall a review on its James Bond merits. However, this is a different kind of Bond film. It doesn't really live up to the womanizing, slick agent, gadget powered thing that I've pretty much always recognised Bond films as being. This is a film directed by Sam Mendes - who has built a name for himself by directing such drama powerhouses as American Beauty and Revolutionary Road - and most importantly, it is shot by Roger Deakins, who can make anything look beautiful. What we have here is James Bond on the brink of physical collapse, terrorist plots, and mostly an existential drama. However, it still has the familiar tropes of a James Bond films, which makes it one of the more intriguing projects of the year. Skyfall takes on a whole different branch to the previous blonde Bond outings, instead 'killing off' Bond in the opening scene. 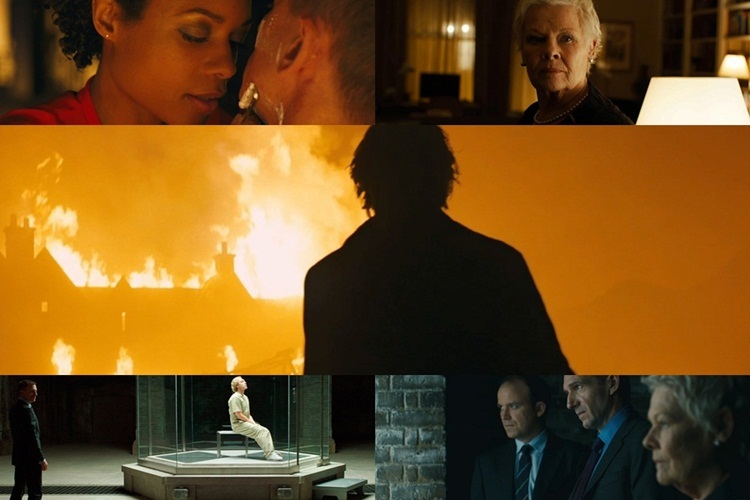 However, while Bond manages to survive this 'death' and live off the grid for a while, he is brought back into the spy game when M (Judi Dench) and MI6 begin receiving threats - and the MI6 headquarters get bombed. Bond is launched into trying to find a stolen hard-drive which could break MI6's operations, which leads him to former agent Silva (Javier Bardem), who is bent on taking down M.
Since Daniel Craig took on the role of the Bond, I think they were heading for a darker, grittier route than what they'd done before. Quantum of Solace took that to heart, and proceeded to make the darkest, grittiest movie it could, therefore sucking the life out of itself. Skyfall treads the fine line between lifelessness due to being so serious and actually being a well-crafted film, thanks to Bond being so beaten, battered and broken, and so disillusioned by the spy life he's so famous for. There's no doubting that Skyfall takes itself seriously, and a little too seriously, at that. However, it breathes life into itself by bring incomparable style to the table, and also by offering a different insight into the supposedly invincible spy. I felt like the best moments were when we saw the true vulnerability in Bond, as he struggled with his fitness tests and taking seemingly simple gunshots. However, he has skills and panache which land him back in the field thanks to M's faith in him. M herself is a much bigger part of this film than I thought she'd be, though I had a little bit of trouble with her transition from the villain to the victim. Either way, she still remains to be a strong character, played wonderfully by Judi Dench, the ultimate Bond Woman. The cast is rather good, with not one person playing to the camp aspects that this film could have. Daniel Craig leads well, using that vulnerability to his advantage. To be honest, he isn't playing the Bond from Casino Royale, he's more going for the Mikael Blomkvist in The Girl with the Dragon Tattoo - there's even that possibility that he can't save himself, and low and behold, a woman could be the one to save him. I thought it was rather interesting delving into Bond's past which has embittered him. The 'Bond Women' in this film were Eve (Naomie Harris) and Severine (Berenice Marlohe), who both had quite brief roles but they certainly weren't thrown around as pure eye candy. Eve was Bond's kind of right hand woman who ended up shooting him, but she seems to have a strong way about her and never lets herself become the damsel in distress. While Severine is a 'damsel in distress', she's someone that needs help because she's subjected to a world where she can't be in control, and that makes her immensely afraid. Also backing Bond up was Q (Ben Whishaw), who has been hailed as a 'fresh, hipster quartermaster', certainly had some good chemistry with Craig and I look forward to seeing him in future instalments to the franchise. Another person who I can't wait to see coming back for more is Gareth Mallory (Ralph Fiennes). As a fan of Fiennes, he could read the telephone book and I would think it's Oscar worthy. Still, I enjoyed the times when he was on screen, and I'm excited by the fact that his character has been left wide open. That's the kind of stuff that'll keep me excited for more Bond. The highlight, though, and no doubt you have heard this before, is Javier Bardem as the villain Silva. From his introduction, in which he chooses to use emasculation as his key to get through to Bond and then threatens to destroy M and MI6, it is impossible to be at all comfortable whenever he is on-screen. Bardem is extremely terrifying, just as he was as Anton Chigurh, though he manages to say a lot more in this movie. However, while Silva is a great villain who seems quite calculated, he only turns up in the movie halfway through. I get that this is because they needed the whole plot of the hard-drive being stolen and all, but missing hard-drives barely make for interesting cinema. In fact, I despair when anything technological gets stolen, because it really isn't that interesting. That highlights the biggest issue I had with this film: the pacing. A whole lot of people have said that the pacing is perfect, but I found it to be a little sluggish. It was far too long before any real conflict happened, because Bond didn't come face to face with Silva for such a long time. Sure, trying to defeat a villain you couldn't see was interesting, but that aspect just dragged out for too long. Silva brought most of the excitement, which was only to be undone by the final act. However, I didn't have much of a problem with the final act. While it took quite a while to find the action (and the action went for an extremely long time, unfortunately), it was interesting to look back into Bond's past. This movie has all the components of a great film, but it comes undone because of the pacing and the sometimes poor script-writing. Taking it on technical merits alone, this movie is just about perfect. 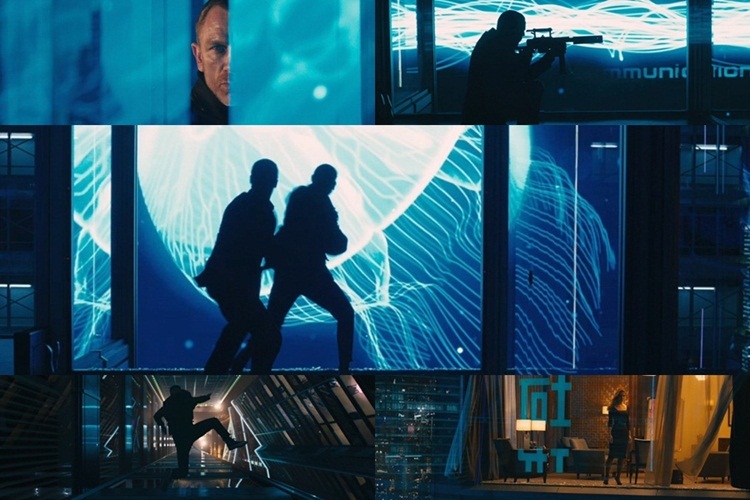 Sam Mendes was a great choice for this film, because he could bring out all of the dramatic elements, while finding the best ways to stage an action sequence without overwhelming it with editing. The score by Thomas Newman was also very good, as it wasn't too loud or over-stated, but it still has those familiar Bond tones. However, by far and away the best thing about this film is the cinematography by Roger Deakins. He used the many locations and beautiful art direction to his very best advantage, and he shoots everything so darn beautifully it is like watching The Tree of Life with less dinosaurs and more suits. That scene in the Shanghai hotel is probably my most favourite scene of the year. Just that they even thought to light the scene with those pretty, changing lights that play out on the front of the glass building. That almost brought me to tears. Which probably says a lot about me. While the movie has many great pros, there's quite a few cons that stop it from achieving greatness. As it is, it is a fine way to celebrate the 50th anniversary of arguably the most famous character on Earth, and definitely the most beautiful tribute they could give. That Shanghai sequence man. I'm probably going to end up saving its picture man. I'm so in love with it. I really loved the film. Like really. Mostly due to Roger Deakins. I love that sequence more than anything at this very moment. OMG, it was so beautiful. I'd say tahts a bit much! and I love the film! Haha, you do know that I power this blog on hyperboles? Then again, I think you'd struggle to find a better photographed film this year. Sure, films like Life of Pi and stuff will probably win in the visual stakes but this movie was seriously beautiful, and there were so many times that I was reminded of The Tree of Life, and Days of Heaven for that matter. Roger Deakins is a wonder man. I won't deny that I liked it more than you. I will agree with you on the fact it's a gorgeous film. (Maybe not the most beautiful of the year; for me, that honor goes to Life of Pi.) And who would've thought that Mendes could tackle a franchise like James Bond with complete ease? (Then again, he could definitely handle action. Just look at Road to Perdition.) Added bonus for me: Ben Whishaw in glasses. Perfect. I knew that Sam Mendes could do it, particularly because of Road to Perdition. He did a wonderful job. I loved Ben Whishaw in glasses, too. He's a fantastic actor. Same! And really? I've only seen Casino Royale and Quantum of Solace. The former was really good. I think I like it more than Skyfall to be honest. You're right on about the cinematography, Stevee. While I've heard people talk about Skyfall getting a Best Picture nomination, I just don't see that happening at all. Even so, I think it totally deserves a nomination for Best Cinematography. Such a gorgeous movie. The Best Picture nomination definitely won't happen, but I really hope they finally give Deakins the award. Seriously. The Shanghai fight scene is my favorite shot in any Bond film. Period. Sorry you didn't like the film more though. It is one of my favourite shot scenes ever. Wow. And I think a rewatch might iron things out! LOVE the photos you've got here Stevee! 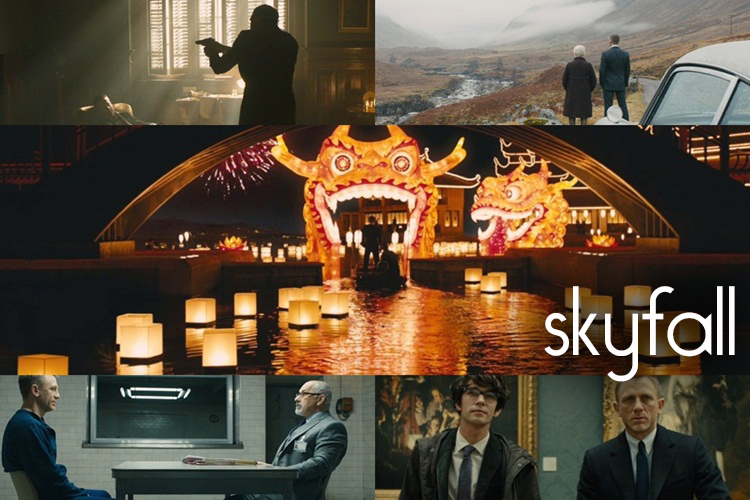 I picked Skyfall as my movie of the month and indeed it could be the most beautifully-shot of the year as well. I too love Craig in Casino Royale, and though I love Skyfall, it still hasn't topped Craig's first outing as Bond for me.